The Kenneth J. Minnaert Center for the Arts Gallery at South Puget Sound Community College seeks submissions for its third annual Fine Art Postcard Exhibit. For a $5.00 entry fee, artists may submit up to five postcard-sized original artworks relating to the theme “It’s the Water”. Postcards will be exhibited from January 13 – February 21, 2014 and sold by auction to support gallery programming. Please confine artwork to the front of the postcard and place the artist’s name, media and email address and/or website on the back of the card. We will use email to contact the artists to invite them to the opening reception and other Gallery events. All submitted work must be original artwork created by the artist. (No reproductions). Please Do Not frame or matt the artwork. No artwork returned. 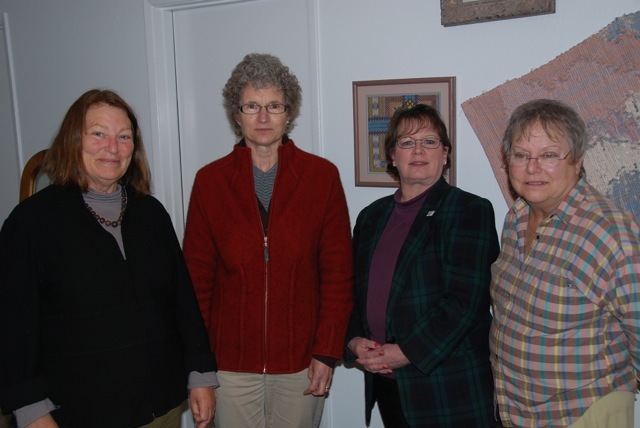 Submitted artwork becomes the property of the Kenneth J Minnaert Center for the Arts Gallery. Images of artwork may be used to promote the current or future postcard exhibits. FYI: Used Looms for Sale at WSU Surplus Store, Pullman, WA. The Department of Apparel, Merchandising, Design and Textiles at Washington State University is selling nine Gilmore looms previously used in teaching studios. Front or back beam straps need to be replaced on most looms. Some looms are missing tie bars. Replacement parts are available through Gilmore Loom Company. The looms are being sold through WSU Surplus Stores. They have public sales Fridays 10:00 a.m. to 3:00 p.m. If you are unable to attend a sale, you can call after noon on Fridays to discuss purchasing without attending the sale. Profits generated from sale will support academic opportunities for AMDT students. Come join us at this wonderful community event for a chance to meet local artists and support a great cause. Enter a pie in our contest, donate some baked goods, or just come ready to enjoy some treats and wonderful handcrafted original treasures. The Handweavers Guild of America (HGA) offers certification in fiber arts: Weaving, Spinning, Dyeing, and Basketry. Application who pass the rigorous requirements receive a Certificate of Excellence (COE) in their chosen field. There are two levels of certification: the first requires proficiency in the basic arts, and the second, Master of Specialized Study, requires a focused, specialized study. An overview of the program can be found at http://weavespindye.org/pages/coeoverview.html. 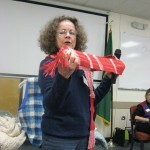 Olympia Weavers Guild was privileged to host the 2013 COE in Spinning. This year, applicants included one in Level 1 and two in Level 2. 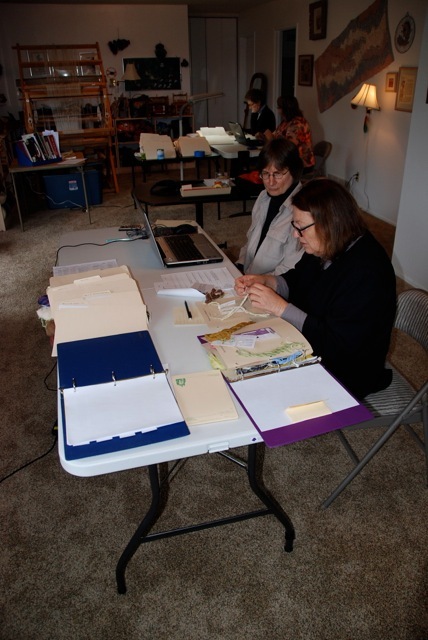 The program involves a registrar, who assembles the submitted work for review by two examiners. 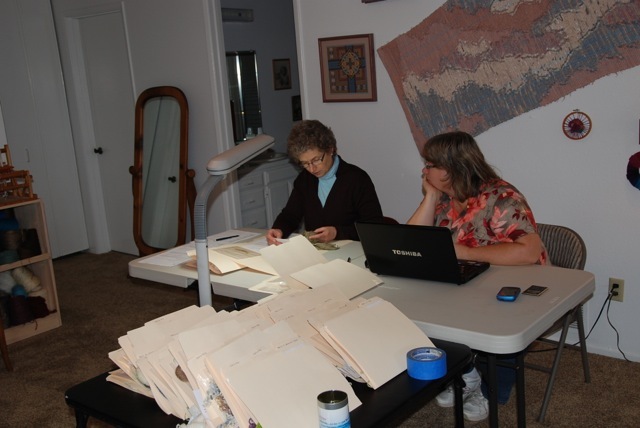 The process is overseen by two representatives from HGA. The OWG chairperson was Lana Schneider, who generously offered her own studio as the site for the examination, which took three days: one to assemble the team and the work, and two intense days of judging and documenting the process. Several members served as scribes, assisting the examiners in documenting the findings, and other members provided food for the committee and lodging for the HGA representatives and examiners. Photos by Sandra Swarbrick, HGA. 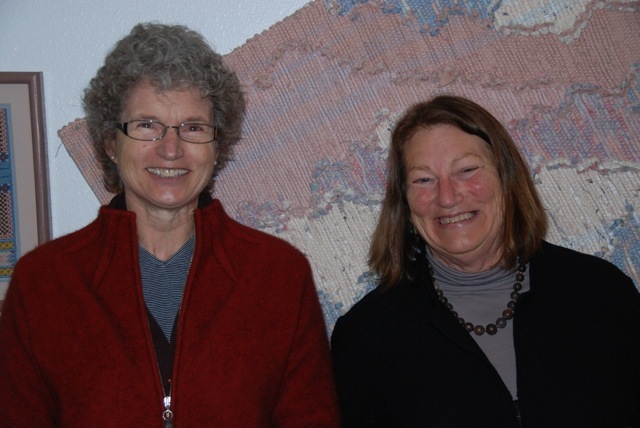 Mary Ann Sanborn, the other HGA representative, gave a very interesting presentation at the October Guild Meeting on Shaker textiles. Both of the Level II submissions were accepted, and the applicants were announced on the HGA website, and in an upcoming issue of Shuttle, Spindle, and Dyepot Magazine. Many of us are becoming aware of where our food comes from and how it is produced, but what about the fibers we wear every day? 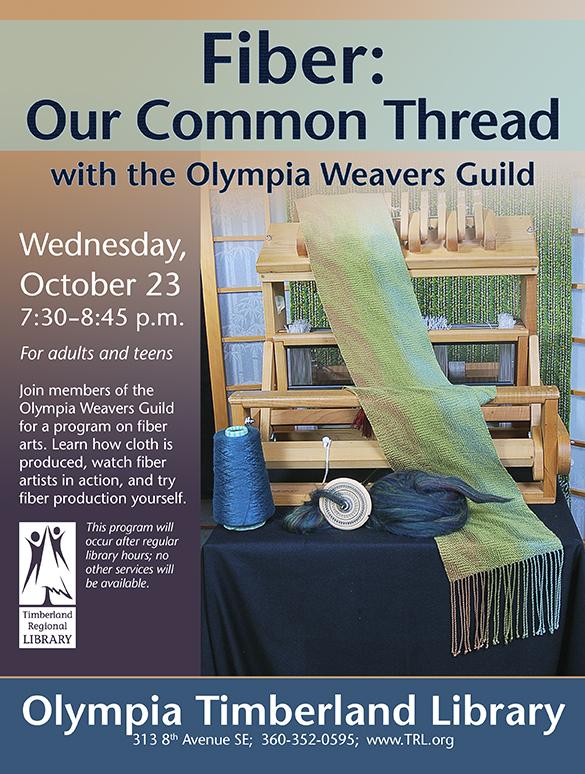 Members of the Olympia Weavers Guild will present “Fiber: Our Common Thread,” a program on fiber and the fiber arts, at the Olympia Timberland Library on Wednesday, October 23 at 7:30 p.m. Learn how cloth is produced, watch fiber artists in action, and try a bit of fiber production yourself. The event takes place after library hours. In many places in the world, if you want a new shirt or a rug, you create it from the fibers on up. 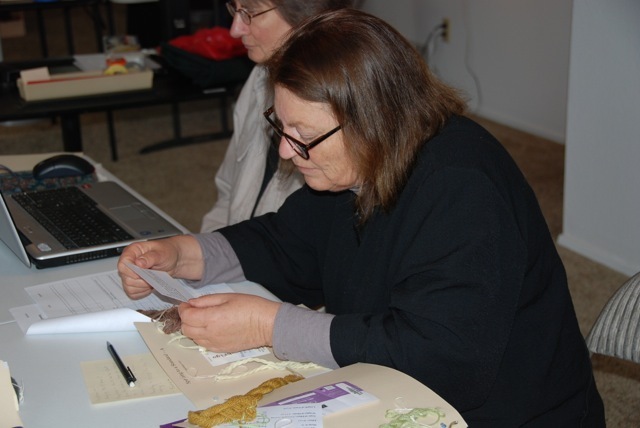 Guild members will describe the production of cloth from seed or animal to closet or home. A brief slide show will introduce the main fibers and techniques used to create textiles in this country, including information on home production of flax into linen and fleece into wool. Program attendees will be able to see textiles made by guild members as they model or show them and to talk with the creators. Much of the evening will be a chance to watch spinners, weavers and felters in action and to see up close what is involved in the production of cloth. There will be an opportunity for attendees to try some of the techniques. The Olympia Weavers Guild was founded in 1949. It is a nonprofit organization that promotes the study of weaving, spinning and many other fiber arts. Members meet once a month for most of the year and sponsor programs and workshops on weaving, spinning and other related crafts. More information about the guild is at http://olympiaweaversguild.org. The Olympia Timberland Library is located at 313 8th Avenue SE. For more information, contact the library at (360) 352-0595 or visit www.TRL.org. Timberland Regional Library provides for the information, reading and lifelong learning needs of the Grays Harbor, Lewis, Mason, Pacific, and Thurston county public at 27 community public libraries and 6 library service partner locations. The library system is funded mainly by local property taxes. Anyone needing special accommodations to participate in a library’s program may contact the library one week in advance. The Arbutus Folk School will host an open house grand opening on Saturday, October 19th from 3-9 pm at its new 3,800 square foot campus across from Olympia City Hall. The school features a woodshop, ceramics studio, space for a wide variety of workshops and performances, a crafter’s gallery and supply store. The school is a venue for Northwest folk crafters and artisans to share their skill through workshops and events. Friday, October 11 and Saturday, October 12. 9:30 am – 5:00 pm. Looking forward to gathering our creative community as we embark on the next step to bringing affordable work-live development to the Greater Olympia Area. Copyright © 2013 Olympia Artspace Alliance, All rights reserved.